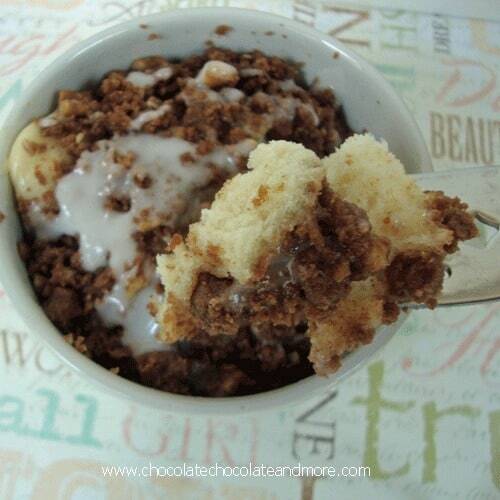 Coffee Cake in a mug - Chocolate Chocolate and More! 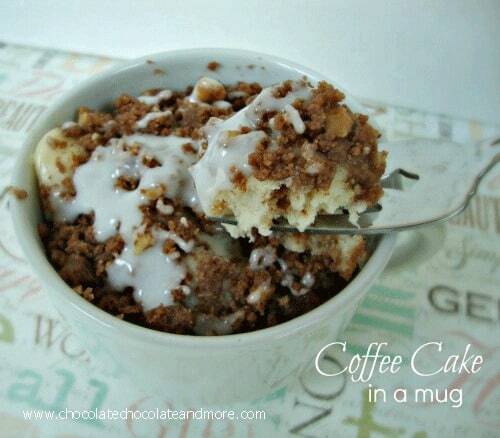 Coffee Cake in a mug-when you just want one serving, not a whole cake, and it’s so good! This one is a little bit of work but it’s so worth it! I love coffee cake fresh out of the oven, still warm, with a little glaze drizzled over top. Now I can have it any time I want! And in less than 10 minutes, probably 5 if I don’t get distracted. This is a true mug cake, one large coffee mug all to yourself or you could be nice and make it in two small mugs and share one with a friend, or your husband. Or you could eat them both yourself, I won’t tell. You can mix the batter directly in the mug or you can make it up in a separate dish. Place softened butter in dish then add sugar. mix until creamy and smooth. Add in your egg, and beat again. Now for your sour cream and vanilla. Stir again. You're almost there. Add in flour and baking powder and blend. Now combine your crumb topping ingredients in a separate bowl. Using a fork, blend the ingredients till crumbly. Now just put it all together, if you mixed in the mug just add the crumb topping on top. I like to layer mine. Batter, some crumbly, more batter, then the rest of the crumbs. Place in the microwave and cook on high for 1 minute. If your making 2 mugs from this recipe, it's probably done. If you made one large mug you probably need to bake for another 20-30 seconds. Combine your powdered sugar and milk, stirring until creamy and smooth. Now drizzle over your warm coffee cake. Get your fork out and enjoy! I can see myself making these the night before for the kids, putting them in the fridge and then letting them pull them out before school in the mornings. Oh yes, super cool mom points! Looking for more mug cake ideas? Check out these other yummy cakes! Chocolate Chip Cookie Dough Mug Cake! Ooooh yes this is def my favorite too—especially because real coffee cake can be so involved. This looks so good! Oh yes please! I’m going to be loving you every time I make this! Pinned it! This sounds ridiculously good. Thank you for sharing this!! I seriously just want to eat it right off of the fork in that first picture. I can smell it!! Yum. Please don’t forget to like us on Facebook Thank you for linking to Foodie Friday! Best one yet! This looks SOOOOOO delicious. I must make it. SOON. I make this all the time! I love this cake in a mug! I love all these mug cakes! Perfect for my husband who is always wanting something sweet! Love this recipe for 1 or 2 people. Perfect for me since my kids are grown. .Please do more. What a great idea, this sounds like a delicious dessert! That just looks so delicious! I will be sharing this with my Facebook followers tomorrow. I like to share a recipe a day with them! Made this for my 12 year old yesterday, but substituted walnuts for the pecans. She said it was amazing!! I love coffee cake, so I know this recipe will be made in the near future! ooookkkkkk, now you’ve done it! I’m going to HAVE to make this! Oh, I love coffee cake, but no one in my house really does. I will have to try this. This looks great, I love the idea of putting it in a mug! Thank you for sharing on Saturday Show and Tell. I hope you’ll join us again this week with some more great ideas! I’m eating this right now and it’s AMAZING! Looks & Sounds amazing!!! Pinning! I’ve made this mug cake before and it’s Amazing! Those of you who can’t eat eggs or are weird about microwaving eggs, you can leave them out. The cake wont rise as much, but will still be super tasty. 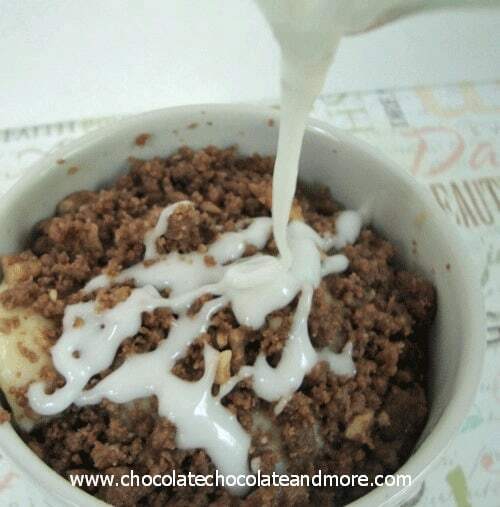 You can also use yogurt instead of sour cream if you don’t have it on hand. This is really good but it took longer than the time specified for two. Almost 3 1/2 minutes but I think time will vary with the type of mug used. And one shared between us was more than enough. We now have another fabulous dessert for tomorrow night!! Ill be using this one again! So glad you enjoyed it CJ. Yes, every microwave is different so you definitely want to find the time that works for yours. I’m with you, mug cakes may be the greatest invention ever! 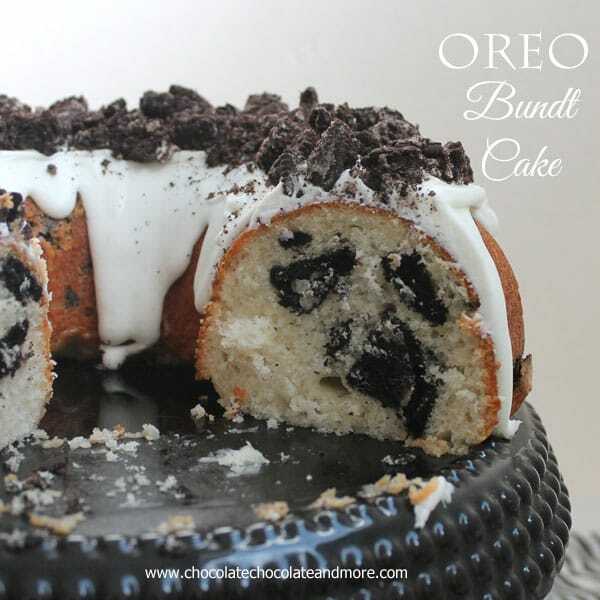 This really does look amazing and I’m going to try it (probably tonight…. which will answer my question). But I was wondering… do you have to “grease” or butter the mug before putting the ingredients in? Thanks so much for sharing these wonderful recipes! The taste and texture is perfect and it’s just the right amount. Ok maybe I am being stupid but I have read and re-read the recipe but I cannot find any mention of coffee in the ingredients.